What is Main Street’s most popular page? It’s the webcam. Webcams are enormously popular these days. Besides taking advantage of their utilitarian usage, such as home security or keeping an eye on a sleeping baby, people love public webcams. They can check the weather, watch special events, see a friend wave at them, or simply practice the age-old guilty pleasure of people watching. To get an idea of just how popular public webcams are, click your way over to EarthCam.com where you can join tens of millions of people observing everything from Times Square in New York City to the spectacular, Baroque Trevi Fountain in Rome. 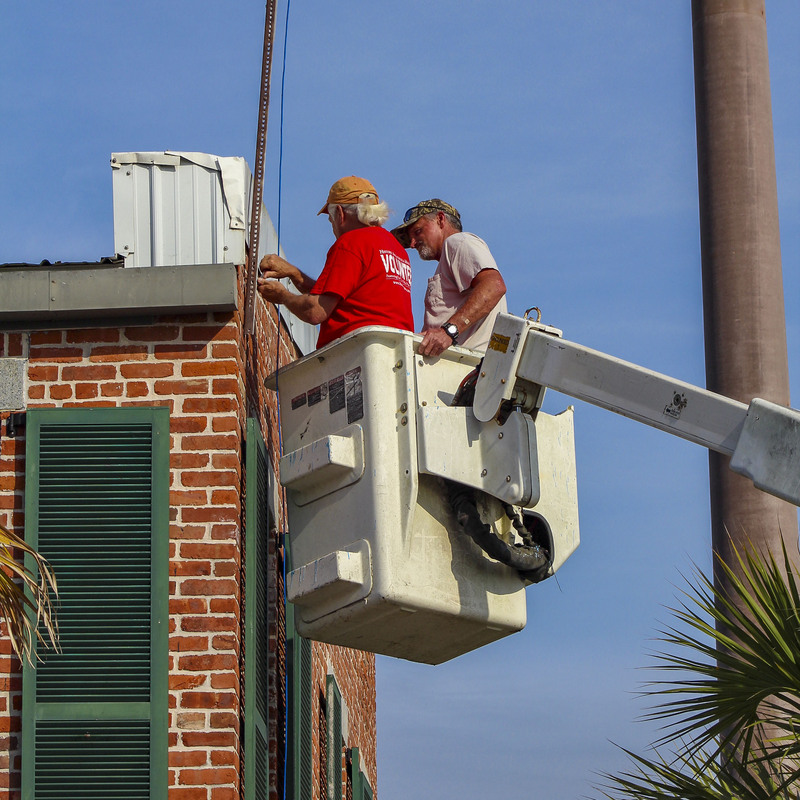 So how did a public webcam get to Riverfront Park in Apalachicola? Jim Bachrach, left, and Robert Osborne install the webcam on City Hall. Photo by Augusta West. The Main Street webcam was the brainchild of Jim Bachrach, president of the Main Street board of directors. The City of Apalachicola and the Franklin County Tourist Development Council then joined in to make a three-way partnership. Financed primarily with a grant from Florida Main Street, the setup (along with downtown-wide WiFi) was designed and configured by city IT consultant David Meyer and Sterling Kendrick of 2K Web Group. The camera itself was installed in April of 2016 on City Hall, viewing Riverfront Park, by none other than Main Street’s president himself, Jim Bachrach. Usage figures show that the idea and effort have paid off. The Main Street webcam gets an average of 1900 views per month with huge spikes on special event days such as the July 3 celebration. Viewers tune in from all over the country. Main Street’s Executive Director, Augusta West, often gets emails from Apalachicola fans about why and how much they enjoy the webcam. And we know these people really are regular viewers. Ms. West also gets (polite) emails and even phone calls when it is down. They want to know when it will be back up. But interest in the webcam is not all from Apalachicola fans and residents. On several occasions major news outlets have requested permission to use the webcam feed when stormy weather is coming our way. It is a very busy City and Main Street feature. But how does all of this work? With a high-resolution digital camera in almost every pocket these days, it is easy to forget the long years, hard work, and millions of dollars that went into its development. It took roughly 80 years of scientific and engineering research between the discovery of the photoelectric effect (light knocking electrons off certain metals) and the development of the image sensor of a digital camera. (Did you know that Albert Einstein received the Nobel Prize in Physics in 1921 for his “discovery of the law of the photoelectric effect”?) A webcam consists of a lens, an image sensor and some electronics that repeatedly sweeps the image from the sensor, sending the stream of images off to a computer server that then broadcasts it here, to the Main Street website. But who needs to know any of that? You just want plug it in and see it work. Right? So join the crowd and join the fun. Bookmark our webcam link now. You’ll return time and time again to enjoy the sights and memories of Riverfront Park in downtown Apalachicola.